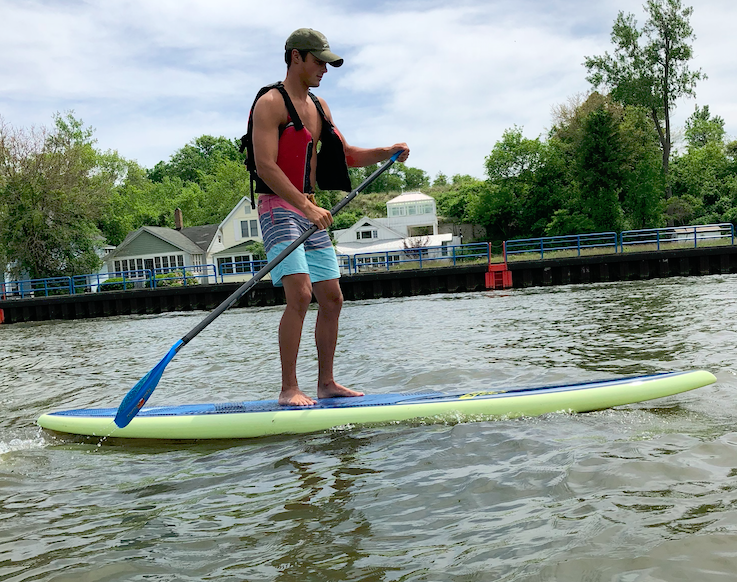 The best paddleboard rental on Lake Macatawa! For most customers, one SUP “stand up paddleboard” rental is enough to get hooked. The calming effect of the water, nature up close and personal, and a great workout equals some great reasons to come paddle boarding. The sport has been around for over a thousand years in Hawaii with the surfers still wanting to be on the water even in calm waters. If this is your first time, our knowledgeable staff will help get you started. We’ll get you started on your knees, show you how to paddle, and you’ll be standing in no time! Renting is one of the best ways to figure out if you like the sport or not. While most everyone falls in love with paddle boarding once they get out on the water, we would never want someone to make the purchase of a paddle board without being certain of their investment. So by renting with us it is a great way to inexpensively get into the sport without having to own a board and should you choose to buy a board from us we will apply the rental rate towards the purchase price of a board. Here are some of the great reasons to come paddle boarding. For more details, please see our Paddleboard Rental Agreement.